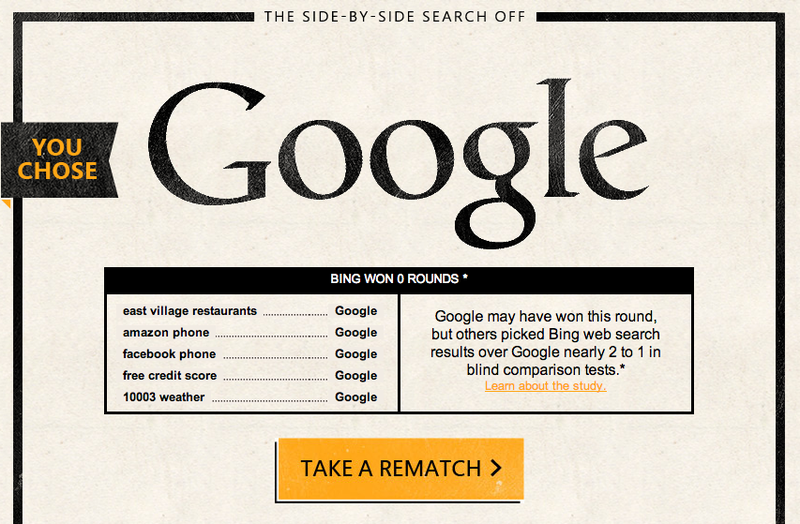 Microsoft Challenges Google To A "Search Off"
Microsoft says “Bing it on”, thinks it can beat Google in a blind test. Wanna try? The problem is, at least for us, that’s just not true. Yes, we took the test, Bing It On, and Google won 5/5. Microsoft deserves kudos for being honest at the end, and we’re sure that taken enough times, the test results might favor Bing. Additionally, we are by no means representative of Bing’s entire potential user-base. That said, however, I don’t believe Microsoft’s claimed 2:1 preferred ratio for a second. Additionally, the results of this experiment might turn out just like the less-than-loved Smoked by Windows campaign. TNW has spent quite a bit of time with Bing, and found that it’s definitely a fine product. Still, none of us who spent quality time with it could actually made the permanent shift to Bing from Google. Enough about us though, what do you think? Take the test via the link below and share your results in the comments!